The Covenant of Mayors initiative is very important for Ukraine, as the country is the most energy-intensive economy in Europe. 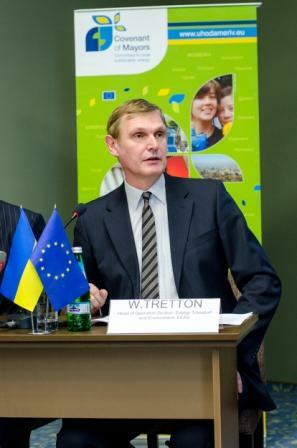 Walter Tretton, Head of Operations Section 3 “Development related to infrastructure (energy, transport) and environment” of the EU Delegation to Ukraine, stressed this point during an information session related to sustainable energy use in Kyiv on January 23. Given the fact that Ukraine is highly dependent on foreign energy resources, the country’s energy use in the forthcoming years will not decline. “Even now when Ukraine gets one of its energy resources – gas – 30% cheaper, every schoolchild can tell you that if you get a 30% rebate, but consume three times more, in the end you will pay much more and become more dependent,” Tretton stressed. Moreover, a huge amount of energy in Ukrainian cities is wasted. Tretton added that this often happens because of inefficiencies like outdated district heating systems. The implementation by Ukrainian municipalities of their sustainable energy commitments under the Covenant of Mayors initiative could address some of the challenges the Ukrainian energy sector is facing. Currently, while 43 Ukrainian cities are already committed to the programme, many of them still face difficulties in achieving the Covenant of Mayors energy targets. To this end, Gabriel Blanc, Programme Manager at the European Commission, announced the establishment of a new Call for Proposals aiming at financing Sustainable Urban Demonstration Projects Programme (SUDeP). With an overall budget of €12.5 million, SUDeP Call for Proposals aims at supporting Eastern Partnership municipalities that have signed the Covenant of Mayors in implementing their sustainable energy action plans. It will provide financial support to municipal projects targeting energy saving, energy efficiency, renewable energy, and reductions in CO2 emissions. Sviatoslav Pavliuk, key expert at the Covenant of Mayors East office, believes the newly established initiative will bear fruit in Ukraine. 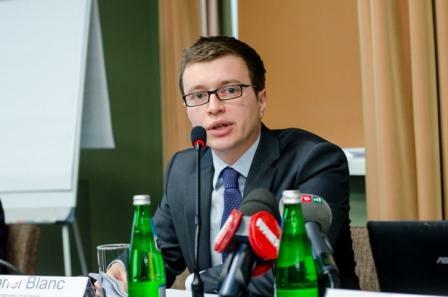 “Ukraine has the biggest interest in such projects among Covenant of Mayors – East countries,” Pavliuk stressed. The information session, “Call for Proposals Supporting the Eastern Partnership Cities in the Implementation of Sustainable Energy Action Plans under the Covenant of Mayors,” was held in Kyiv on January 23. It brought together 75 representatives of Ukrainian and 5 representatives of Belarussian municipalities, the European Commission, as well as representatives from the Ukrainian ministries. The main objective of the event was to equip all stakeholders with the key tools necessary to apply for the EU Call for Proposals “SUDEP”, aiming at implementing sustainable energy projects within the Covenant of Mayors initiative. The Covenant of Mayors is a mainstream European movement involving local and regional authorities voluntarily committing to increasing energy efficiency and use of renewable energy sources on their territories. By their commitment, Covenant signatories aim to meet and exceed the European Union’s 20% CO2 reduction objective by 2020.